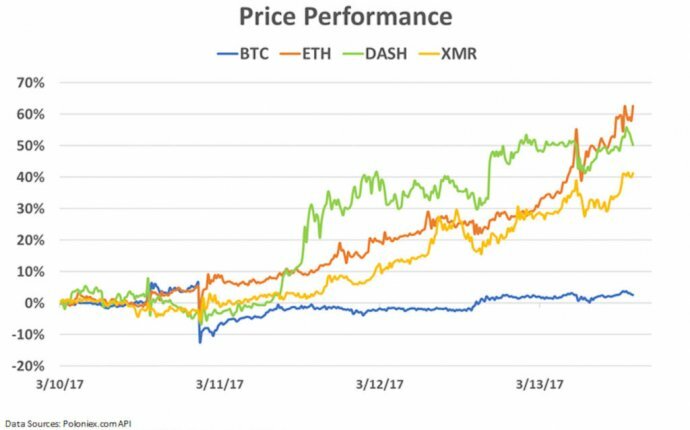 As it overtakes Ripple, Dash is now behind only Bitcoin and Ethereum in terms of market value. Dash marked an important milestone today as the privacy focused cryptocurrency made it to the top three blockchain asset spot. The market value of all the Dash tokens in circulation is now over $263 million, well over Ripple’s $204 million market cap and below only Ethereum and Bitcoin. Already at all time highs when we last reported on the rally just two days ago, Dash has jumped about 30% since. One possible reason for the new jump in price, from $28 to $37, is a recent show of confidence in Dash by cryptocurrency advocate and investor Roger Ver, aka “Bitcoin Jesus”. He reportedly bought Dash in protest of the censorship of major Bitcoin community forums. The Dash team has also announced a partnership with Wall of Coins that allows user to buy and sell cryptocurrency at banks such as Chase, Bank of America and Wells Fargo, as well as financial service companies like MoneyGram and Western Union. Wall of Coins is a web based platform that allows users to buy Bitcoin and Dash with cash, or sell Bitcoin and Dash for cash, in a peer-to-peer manner. Through the website, customers are instructed to deposit cash at a local financial institution, and in a matter of minutes, receive Dash or Bitcoin directly to a software wallet of their choice.